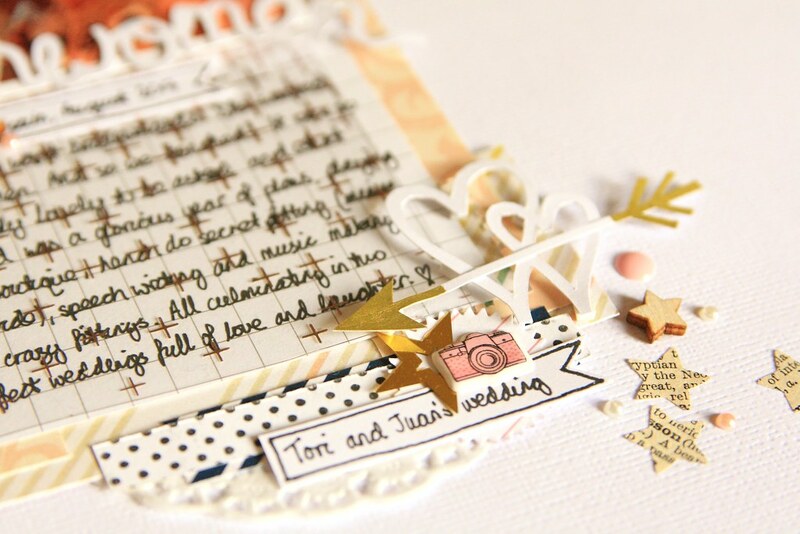 I've got a page from the scrapbook to share today, and it's one of my favourites I've ever made! I love when that happens, but I often feel it's a bit unpredictable. Maybe it's just because this was such a lovely memory and it's great to have it recorded. It has to be acknowledged that this is not a brilliant photo. It's a selfie I took on my phone of 4 of us being bridesmaids. We were all ready to go, and despite the sweltering heat (even in the evening the temperature was over 40 degrees) we were so excited to be accompanying one of our best friends down the aisle with her fiance in the beautiful countryside of southern Spain. The bride and groom were having some official photos taken before the ceremony and so I snapped this. A happy moment. I pulled out some supplies to go with the photo; I promise that we weren't wearing lashings of fake tan as this picture seems to imply. It's just that the sun was so bright my phone struggled to keep the colours true. 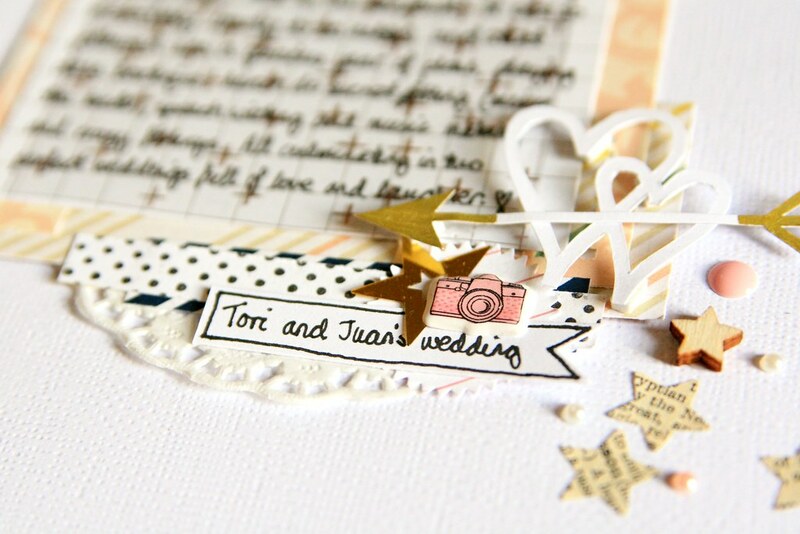 Our dresses were in lovely shades of dusty pink and soft beige and I included touches of pink in the supplies I used. However, I also found that woodgrain worked really well, and little touches of yellow and gold to bring out the sunshine. Finally I wanted to incorporate some black and white elements as I'm finding more and more that I like how striking they look. 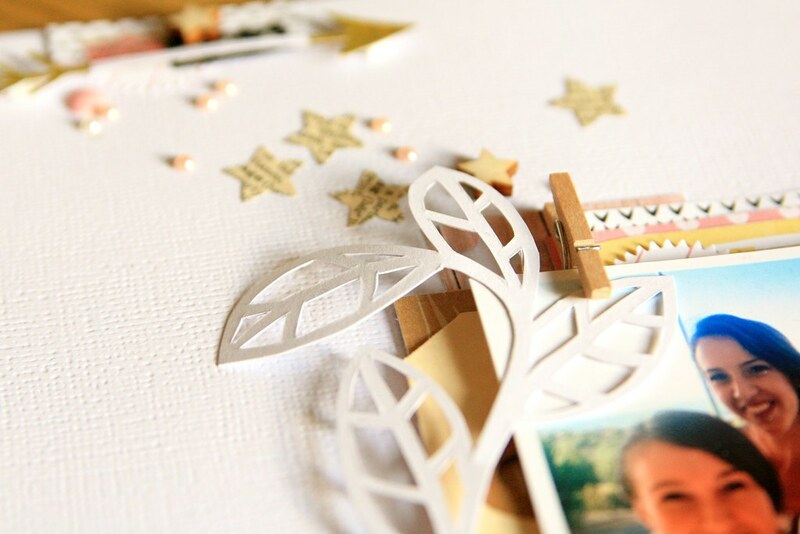 A staple of my scrapbooking is the white cardstock background and it looks like my love of this is here to stay. I like the uncluttered feel, the space it gives to detailed embellishments and I think it often looks quite sophisticated. Plus a white background gives the option to add white-on-white elements for texture and dimension. 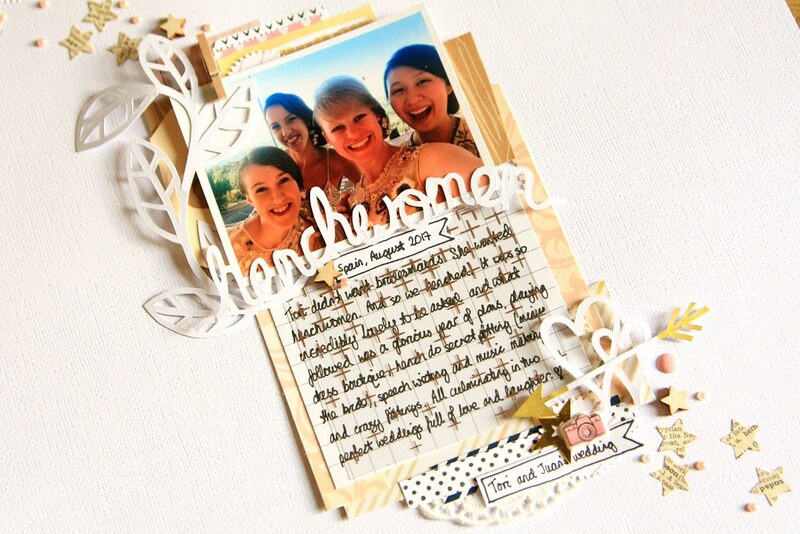 Onto the background, I layered up different elements to frame my photo: patterned paper, tags, doilies, punched shapes and tabs. I kept everything to a central block with a little bit of detail at the top and bottom of the layout. I doodled the title 'Henchwomen' for this page, making sure the word was the right length to just fit across the bottom of my photo. 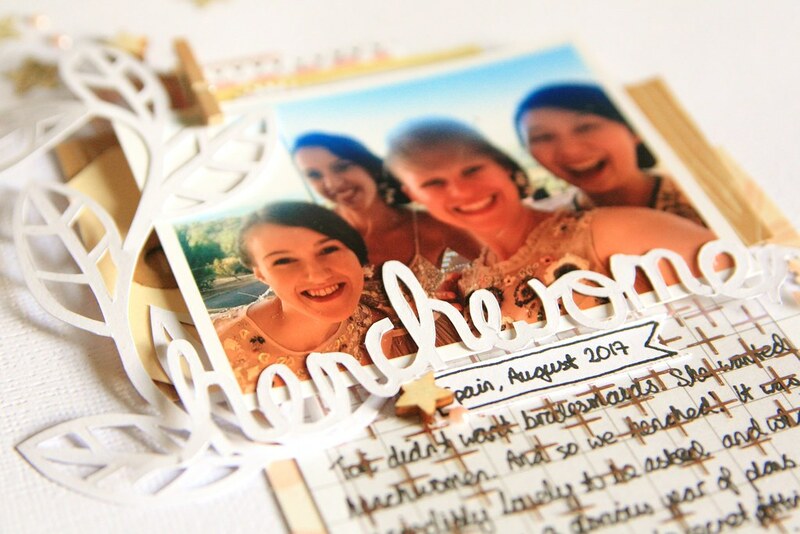 I then cut the title out of white cardstock with my craft knife. While the background cardstock is textured, I often use smooth card for titles as creates a subtle contrast, lifting it from the page a little bit and distinguishing it from everything else. I also sketched out a little leafy vine and a couple of hearts, popping them up on little foam squares for impact. 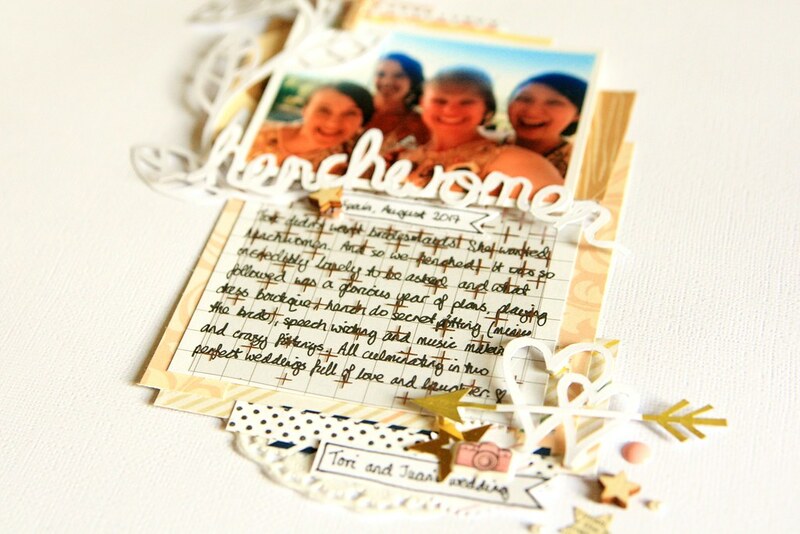 I like the intricate look of papercuts, and I also hand cut some arrow shapes to position around the page. By adding them in 3 places, the design has more flow and the arrows direct attention to the focal points. I experimented colouring in the ends with a gold gel pen and I really like the look. I'd love to try the gold-dipped look with a whole title! I added my journalling onto a grid paper and topped it with a transparency. The text is still legible underneath but it was another nice opportunity to introduce a touch of gold. I also created little tabs to write on to add the key details: useful as I don't then need to include these in the text of my journalling. 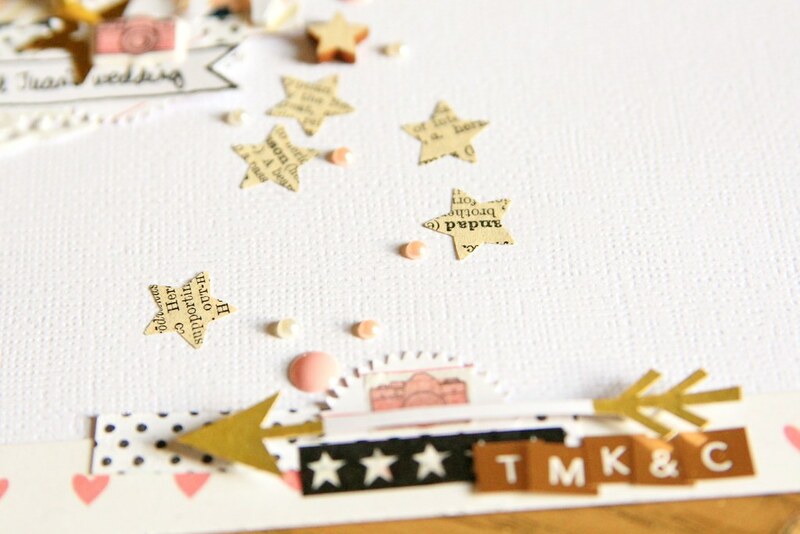 I finished off the layout with a sprinkling of embellishment: little letters for the bridesmaids' initials, enamel dots and little stick pearls, washi tape and little camera stickers and finally some stars, both punched from dictionary pages and in wood veneer. I will make a pocket page to go with this one at some point; I definitely want to scrap more pages about this beautiful wedding! When I do that, I will aim to incorporate some of these same details to link the pages thematically. Page complete! All ready for the album. P.S. Working with gold has made me feel a bit Christmassy; I'm looking forward to digging out some pictures from last year to work with. 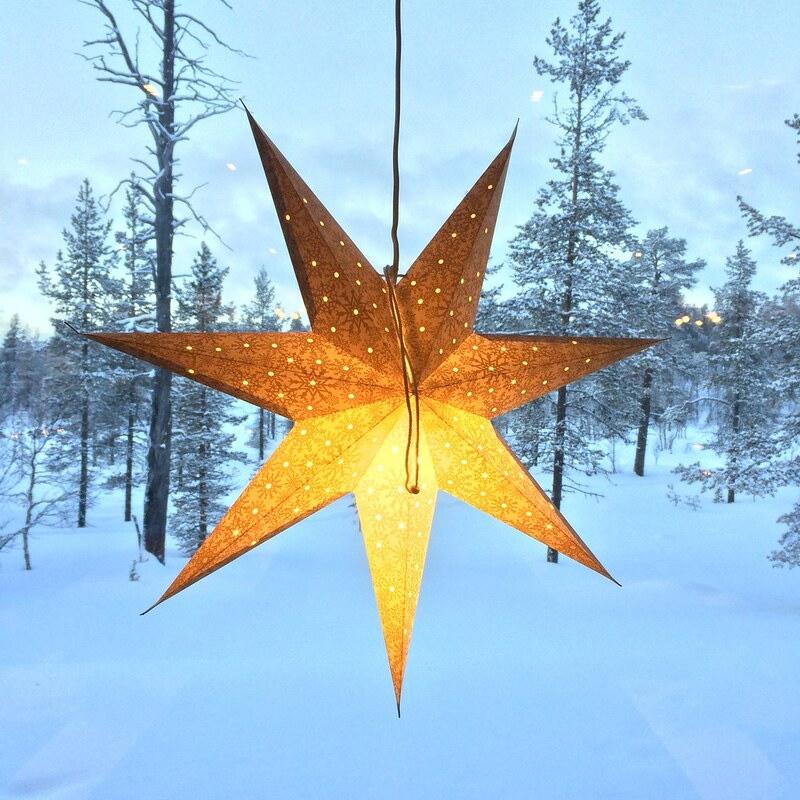 Today I'm sharing an entry from my travel journal: this one from my time in Finland back in February. It's a long one, but that's just because I like to record the detail and come back to it all later. 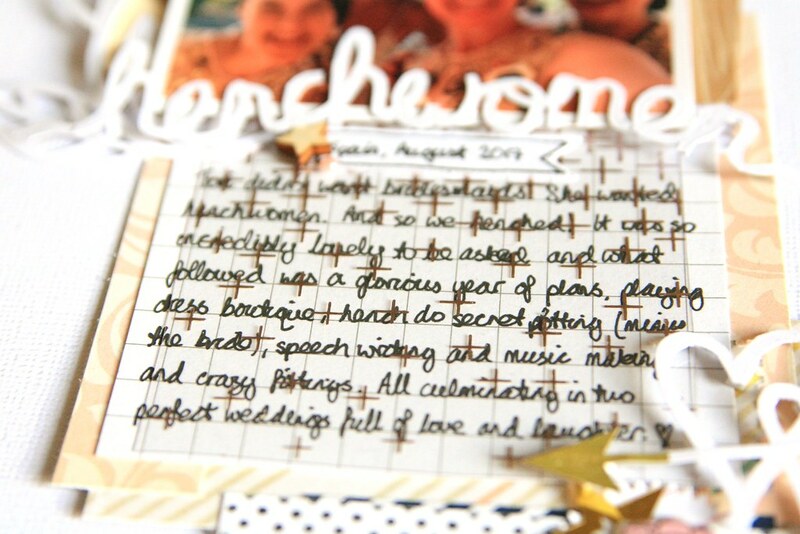 The ultimate ambition is, of course, to get it all in the scrapbook. 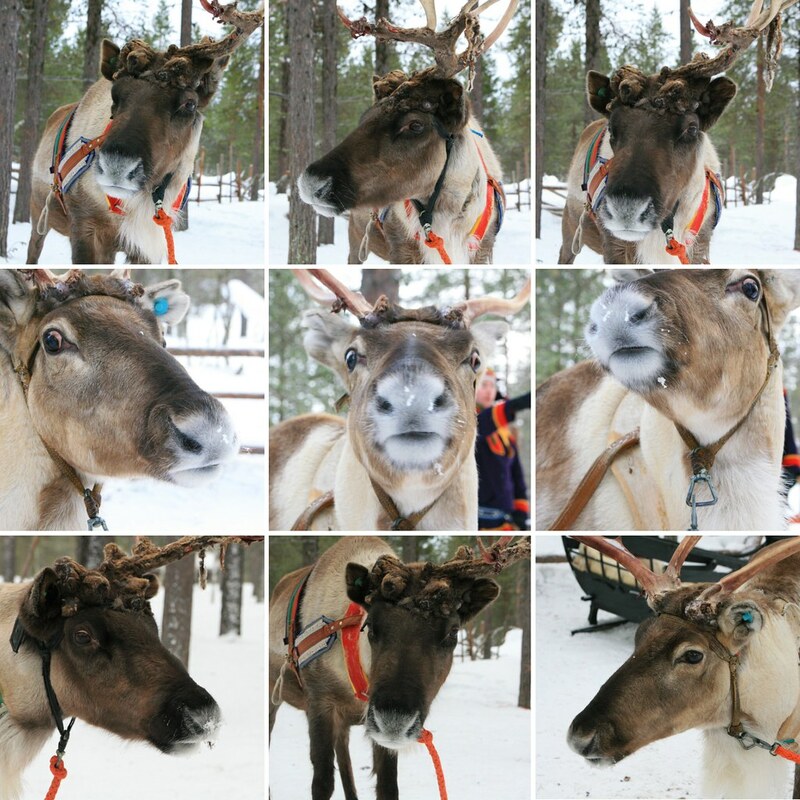 But for now, here's a story about a meeting with reindeer. And rather a lot of reindeer facts because I learned a lot and got carried away writing it all down. I was up at eight. Which isn't that early but after getting in the night before sometime past eleven, and then obviously having to hang out for a bit by the fire with a cuppa, it was somehow gone one when I went to bed. Oops! However, revived by the prospect of breakfast, I upped and showered and went in search of foodstuffs. I wasn't disappointed: I started with a cursory plate of eggs and bread (and a little pastry that I thought was going to be some sort of Scandinavian cinnamon roll pastry style scenario but turned out to be full of something that I can only describe as soggy rice: disappointing). Then, the key player: there was a GIANT tureen of porridge. Knowing I was going to be out in the cold for several hours, I fully availed myself of maximum porridge, and then added banana chips, raisins, pumpkin seeds and other unidentifiable seeds to the mixture, just because they were there and all laid out in cute little bowls. And then I chucked in a big dollop of jam. Because jam. And I found heart shaped ginger biscuits, which I thought might go well on the side with a cup of tea. Having hoovered this up, it was time to suit up and boot up (in my human sleeping bag ensemble, see this post for description of layers) and head out for snowmobile time. The Fins pronounce it "snow mobile" as in mobile phone. I prefer to say snowmobile, like batmobile. But I suppose if batman needs to take a call he could do that on his Bat mobile. Anyway, we got a quick lesson: you push a button to make it start, then it has a go lever on one handle and a stop lever on the other handle. Or a brake, as it's more commonly known. The other important buttons are for making the handles warm while you drive, or a bit cooler if you go overboard with the heated handles. 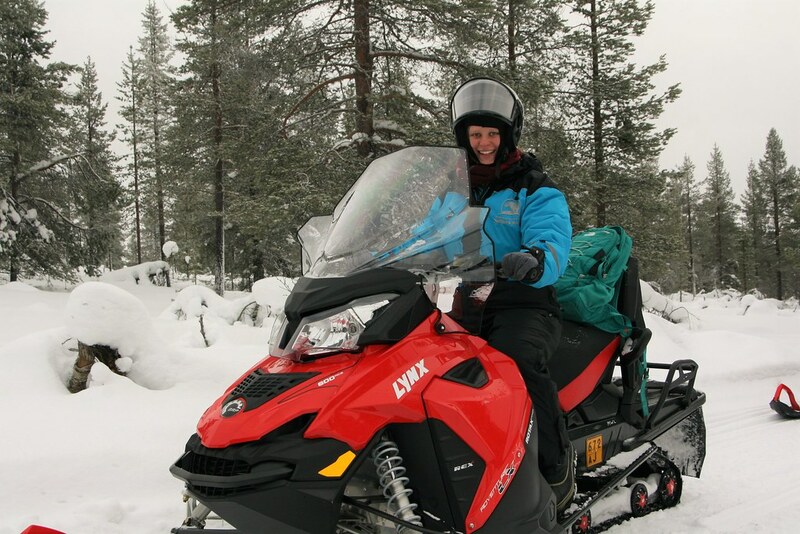 According to Finnish law, you need a driving license to drive a snowmobile, you must be over 18 and in no way under the influence of alcohol, or presumably other naughty substances. I was only under the influence of tea and porridge, both of which are wholesome and not naughty. What it comes down to is that a snowmobile is basically a go-cart on skis. With heated handles. They were bigger than I thought they would be, and are designed to seat two, but as a solo traveller (thank you hefty single supplement) I got to drive my own for the whole time. No sharing for me! As anyone who has ever heard my tirade against sharing plates can attest (or indeed, anyone who has ever tried to share my food: just DON'T) having my own drive was a win. 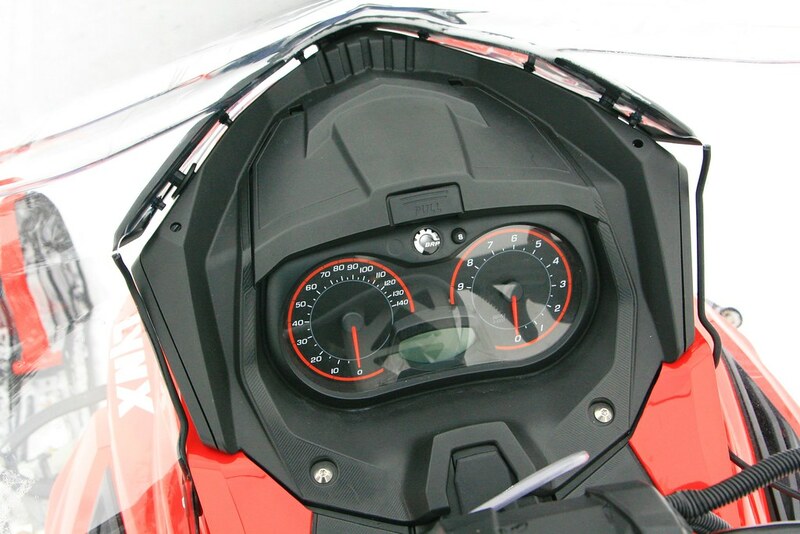 Given the whole driving licence thing, I had thought snowmobiles would be tricky to drive, but they weren't. Helmet on, visor down and off we went. We stuck to trails, which are easier than going off track where you can't tell what's a drift or which snow might give way when. Anyway, you point the skis and go and it goes. The speed limit was 40km/h but it was rare that we got over 30 in our little rank, snowmobiling along in a line. Holding a straight line required more effort than you might think as the skis would try and take the path of least resistance, but as long as you hold onto the handles tight and keep true, you can win the battle of where you go. Leaning into corners and using your body weight to turn also helped and I was a happy bunny. It wasn't long before I was belting out hits from Legally Blonde The Musical as I drove, happy as Larry to be bowling along through lovely scenery, feeling the cold rush of air, exhilarated, alive. I wasn't in the least cold. And I was pretty confident that the growl of the engine masked my warbling (or if it didn't, no one mentioned the singing). We sped along, gaining in confidence and the day was clear and crisp; a little overcast but the sun peeped through the gaps in the clouds. We traversed little bridges, crossed the odd road, passed skiers and whizzed along forest tracks. We communicated along the snowmobile safari route with arm signals. Pumping your arm up and down in the air means go, flapping your arm up and down, extended straight out means slow down and watch out, and raising your fist in the air means stop. Although that becomes apparent when you ram into the person in front. I didn't, I'm just making an observation. Whenever you see one of these signals in front, you copy it for the benefit of the people behind. Riding alone meant that I didn't have a passenger to take care of this for me - unlike the other lazy drivers who simply recruited their passengers for the job. However, I quickly found that gesturing with my left hand made me grip more tightly with my right hand. Or throttle hand, as perhaps it should be known. I'm possibly the only numpty in the line who goes quicker while making the slow-down hand signal. It's just I had to hold on tighter to keep the skis straight. It was legit, honest. I loved driving that thing. It was very freeing and mosying along in line meant I could enjoy the easy pace without feeling the need to steel myself into daredevil mode. But there was still a little rush from speeding over little bumps and hills, or jamming the throttle just a little when cresting a mound and heading down the other side. VROOOOOM. I did keep my stopping distance as instructed though. And I did not go off piste or need digging out of any drifts. So well done me. 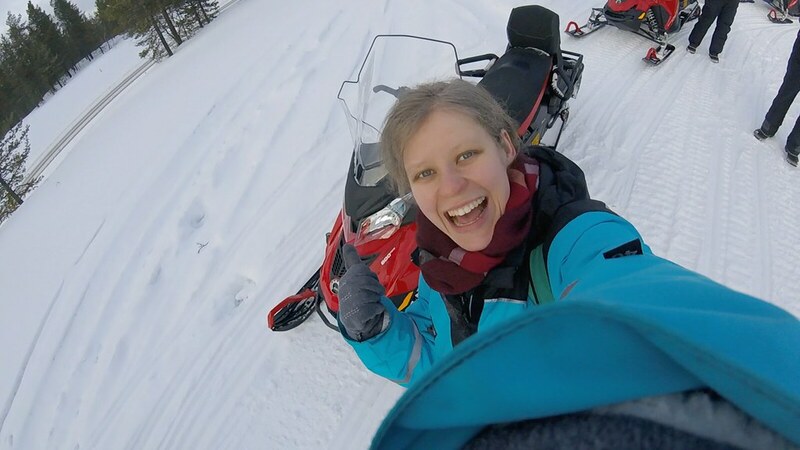 Our destination was a reindeer farm and we pulled up in a long line of snowmobiles, leaving our helmets and trudging through the snow. I mean, or course there were, but it's one thing to know you're going to see reindeer and quite another to then actually find yourself facing one. They were hitched up to little sleighs, each of which carried two people seated with legs out, close to the floor. Time for a ride! I did have to share this time but didn't mind as I hadn't realised we would even get the opportunity to drive a sleigh. That was pretty cool. They gave us driving instructions which boiled down to the fact that the reindeer will probably not go very fast, they do this all the time and they know the way. If you want them to go a bit quicker, shake the rope, but they will probably ignore you. If they run off, pull on the rope and they will stop. Here endeth the lesson. When it was our turn, we reclined into our low-slung sleigh and trotted off, slowing almost immediately to a comfortable shamble, the reindeer seeming disinclined to do much more. After a half-hearted rope shake, we let him be and just enjoyed the scenery, the trees, the hush, the snow. We took it in turns driving (i.e. holding the rope) and it was good fun. As we rounded the final bend, the reindeer perked up a little, spotting the little grey-green pile of lichen that his keeper had left for him. This was apparently an appetising prospect as he trotted up to the pile with gusto, munching it down. 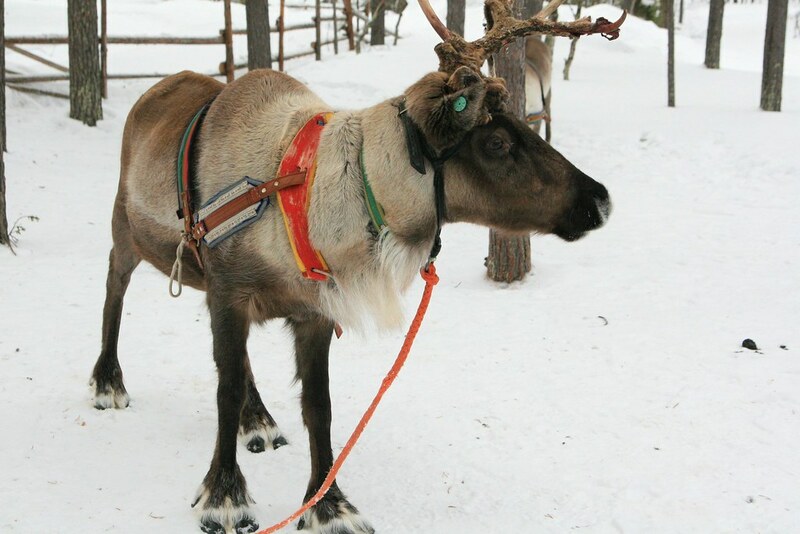 If self-drive cars turn out to be anything like as reliable as a reindeer, I think we're all going to be fine. Especially if they run on lichen. After our driving lesson was complete, it was time to learn to lasso a reindeer. Or more accurately, an old set of antlers perched on the floor. Possibly there's more to lassoing things than meets the eye, but what I took away from it was that you hold the rope, chuck it overarm at the antlers and hope. Clearly I wasn't hoping hard enough as while my aim was true, I fell short by about three inches. On the plus side, the loop did open out. It just didn't snag a reindeer. Never mind. I'll catch one next time. Anyway, if I've observed anything it's that making the effort to lasso a reindeer seems overcomplicated when I've seen them run around for a pile of scrubby tree scrapings. You catch more flies with honey, and I suspect I would catch more reindeer with lichen. 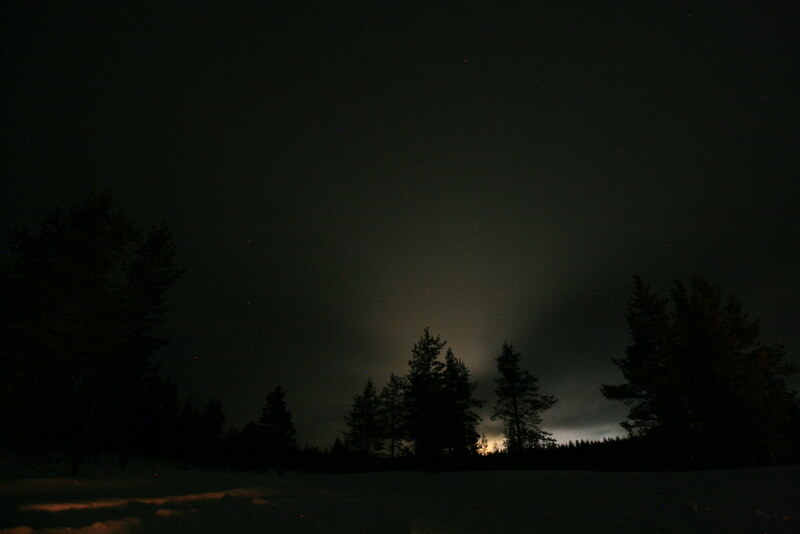 We all piled inside a warm, wooden lodge and were served tea and cake and a lady in traditional Finnish costume gave us a talk about reindeer which was really interesting. 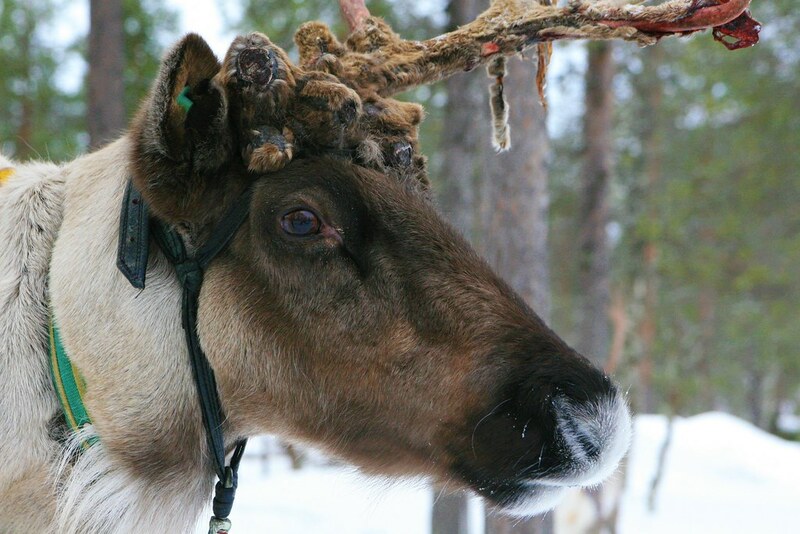 All reindeer grow their antlers in the summer when there's more food and they have more energy to devote to the task. They can grow up to 2cm a day as they have only a couple of months to reach peak antlers. The antlers have a blood supply while they grow and are covered in velvet. Then once they're done, they harden and the blood stops heading to them, and the reindeer scrape off the velvet. The males grow the biggest antlers by far; they can weigh up to 15kg. Massive. Then in October they fight each other to collect a harem of lady reindeer. A successful chappie could acquire a herd for himself of up to 50 female reindeer. Then by November, once they're done fighting they shed the antlers as they're massively impractical and heavy to carry around. The winter is hard on the males because they use up their store of energy from the summer very quickly through fighting other reindeer. The female of the species is rather more practical in her antler growth. They grow smallish ones in summer, conserving calcium and energy, and then they keep their horns through their pregnancies, usually from October to the time when their little ones are born. This is useful for foraging for food, and not showy or cumbersome unlike the men's affairs. The ladies are also not above a bit of argy bargy: when the males have done some foraging and dug and scraped away snow to reveal some edible morsel, the females can shove them out of the way with a face full of prongs and chow down with a ladies' lunch. Pretty smart. 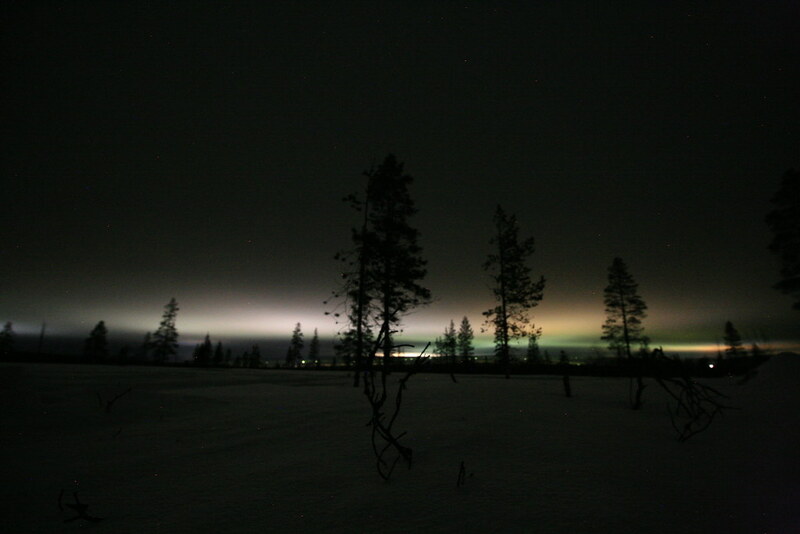 Anyway, like clockwork, a week after the baby reindeer are born, off come the antlers, ready to start the cycle again. The babies grow antlers too. Just little ones that look a bit like pencils, but I like that they try. In summer, the reindeer eat loads of things. 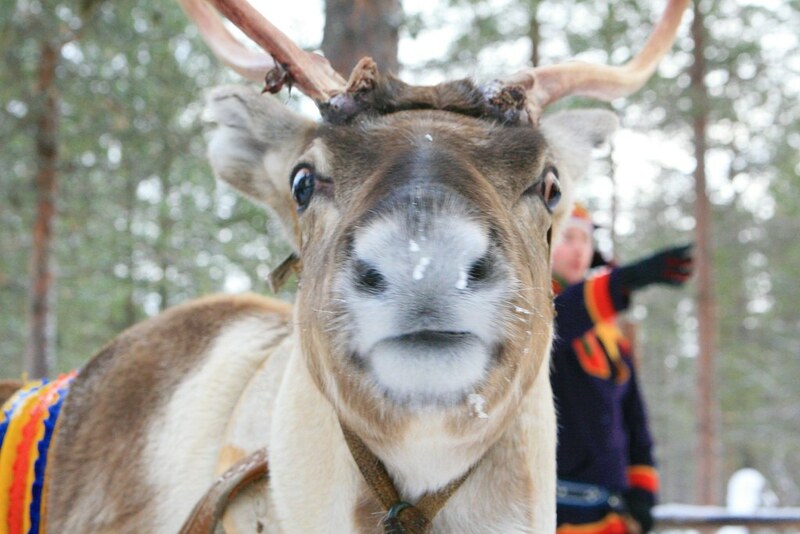 They particularly love to find mushrooms at the end of summer: they help to bulk the reindeer up and get in a good layer of fat and stored energy for winter. Does anyone else really enjoy the fact that reindeer love mushrooms? They also shed their thick hair in the summer; the Guide lady said they don't look very pretty; a bit patchy and mangy as their shorter, dark undercoat is revealed. But come the colder months, they grow back their longer hair, which is lustrous and thick at 1700 hairs per square centimetre. That's a lot of hair. 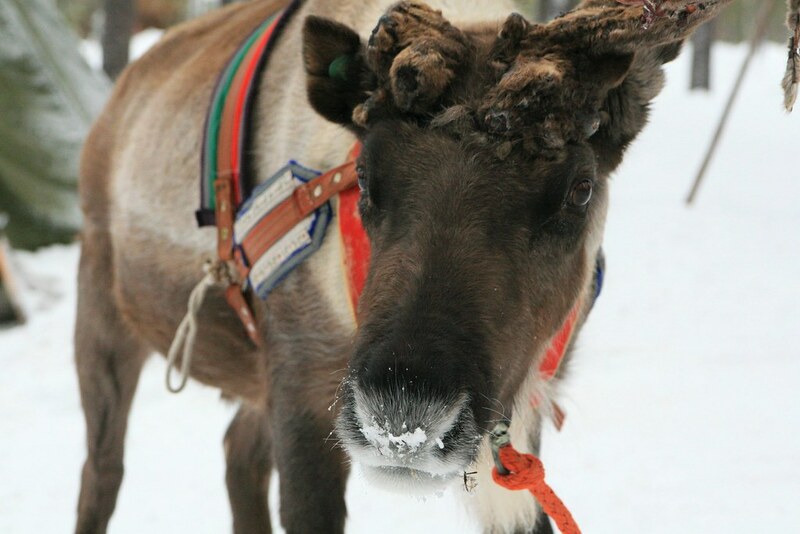 And each hair contains air which insulates the reindeer. Winter can get down to -40 but that's not problem for the reindeer. "I'm not saying they like it, but they can survive it," according to our guide. Anyway, they basically eat lichen that they can scrounge from under the snow or off the sides of trees. So not the most appealing diet evs.